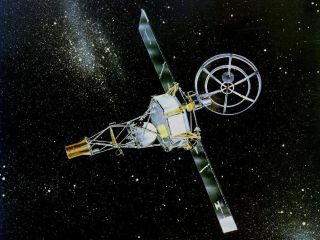 Mariner 2 was the first successful interplanetary spacecraft. It flew past Venus in 1962. Fifty years ago today (Dec. 14), NASA's Mariner 2 spacecraft made its closest approach to the planet Venus, marking the first-ever flyby of another planet. Mariner 2 zoomed to within 21,564 miles (34,675 kilometers) of Venus on Dec. 14, 1962, gathering a trove of data about Earth's hellishly hot sister planet. The probe took the first close-up measurements of Venus' scorching temperatures, for example, helping confirm scientists' suspicions that a runaway greenhouse effect had taken hold of the world. Tracking Mariner 2's radio signals, researchers also calculated Venus' mass with unprecedented precision, NASA officials said. "JPL has always attempted to do mighty things on behalf of NASA and our nation," Charles Elachi, director of NASA's Jet Propulsion Laboratory in Pasadena, Calif., which managed Mariner 2's mission, said in a statement. "Achieving America's first 'first in space' is among the lab's proudest achievements." Mariner 2 had a bumpy ride. Shortly after launch on Aug. 27, 1962, an electrical short caused the probe's rocket to roll, rendering it unresponsive to guidance commands. But the short circuit mysteriously healed itself about a minute later, NASA officials said. Things got dicey during Mariner 2's cruise to Venus, too. A solar panel on the spacecraft stopped working on two separate occasions, and attitude-controlling gyroscopes misbehaved. Further, the probe's temperature rose dramatically as it approached Venus, causing managers to worry that Mariner 2 might be cooked before it could complete its mission. But Mariner 2 overcame all of this, and the rest is history. In addition to lifting Venus' veil, the spacecraft's observations also confirmed the existence of the solar wind and enabled scientists to refine the value of the astronomical unit — the distance from Earth to the sun, which is about 93 million miles (150 million km). In the half-century after Mariner 2's close encounter, other spacecraft have further studied the second planet from the sun. The Soviet Union even landed a number of probes on Venus' surface, beginning with Venera 7 in 1970. But Mariner 2 will always have a special place in history. "There will be other missions to Venus, but there will never be another first mission to Venus," Jack James of JPL, Mariner 2's project manager, said before his death in 2001.